All EastWest credit card holders will definitely enjoy these 2014 promo treats. Just make sure to use your Eastwest credit card for your purchases on these partner establishments and you’ll get FREE delicious treats and technology perks. Eastwest promo for 2016 and 2017 gives you plenty of good reasons to enjoy shopping! Hi Eastwest Bank Cardholders! Here are your latest perks only from Eastwest Bank Visa Credit Cards. Enjoy plenty of food treats, exclusive perks, and more promotion items for all members to surely enjoy. Get to enjoy FREE treats this holiday season for minimum single receipts of P2000, P4,000 and P10,000. This Eastwest Credit Card Promo is valid within promo period from November 2, 2014 to January 31, 2015. Redemption period is from November 2, 2014 to April 1, 2015. Present your EastWest Visa Credit Card and surrender the valid original credit card charge slip/s (Customer’s copy) at participating SM Cinema ticket counters nationwide. EastWest Visa Credit Card will be validated against the credit card charge slip/s presented. The credit card details on the charge slip/s must match with the EastWest Visa Credit Card presented. This EastWest Credit Card promo is exclusive to EastWest Classic & Gold MasterCard, EastWest Platinum MasterCard, EastWest Dolce Vita MasterCard, EastWest Practical MasterCard and Hyundai MasterCard Credit Cardholders (”EastWest MasterCard Cardholders”) in good credit standing*. EastWest EveryDay MasterCard Credit Cards and other EastWest Credit Cards which do not carry the MasterCard mark are excluded from this promo. in order for you to qualify for these sumptuous FREE Dining Treats from Big Better Burgers, Classic Savory, Mrs. Fields and Papa John’s Pizza (“Partner Merchants”), you as an EastWest MasterCard Cardholder just need to make a purchase using your EastWest MasterCard at any merchant during the promo period. Promo period is from July 16 to October 15, 2014. Redemption period is from July 16 to December 15, 2014. Simply shop at any Lacoste Footwear branch using your EastWest Credit Card and you can enjoy up to 50% OFF on selected Lacoste items from July 11 to 16, 2014. Here’s more you’ll get 15% OFF on regular-priced items from July 1 to 31, 2014. In addition to this exclusive deal, there is a 0% interest on installment for a minimum single-receipt purchase of Php3,000. Terms and conditions will apply. Hi Eastwest Bank Cardholders! There are free meals at stake from Max’s. Just make a minimum spend of P2,000 or P4,000 or merchant installment transactions (for P10,000 spend requirement) anywhere, you get free Max’s Restaurant dishes. 1. The Qualified Cards are EastWest Classic & Gold MasterCard and Visa, EastWest Platinum MasterCard, EastWest Dolce Vita MasterCard, EastWest Practical MasterCard, Hyundai MasterCard and LausAutoGroup Visa Credit Cardholders (”Cardholders”) in good credit standing. Take note! The EastWest EveryDay MasterCard credit cards are excluded from this promo. To these redeem free meals, all you have to do is to present the charge slip to Max’s Restaurant staff, together with your Eastwest Bank Credit Card and your valid ID. See to it that the charge slip shows clearly the transaction date, amount, and the last four digits of your credit card. Remember, only a maximum of (3) three meals can be redeemed per card per store only. You can have it dine-in or take-out. Promo Period is from March until May 2014 only. Are you still making your travel plans this summer? Well, Eastwest offers you a chance to enjoy a HongKong vacation this year. Join now the EastWest Dream Travel Promo and get a chance to win 3 days and 2 nights Hong Kong Holiday for 2! This Eastwest promo runs until April 15, 2014. Only One (1) monthly winner. – Pre-loaded Travel Money Card in HK $ worth Php 10,000. *Prize does not include Travel tax and other surcharges. Remember, this Eastwest Bank promo runs until April 2014 only. Grab this awesome FREE Burger King treats! Just use you EastWest bank VISA credit card and spend a minimum of P2,000 to enjoy treats from FREE from Burger King and EastWest Bank credit cards. Promo period is from Dec. 15, 2013 – March 14, 2014. Redemption starts Dec. 15, 2013 – May 13, 2014. 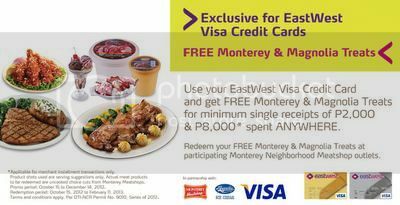 If you are one of the lucky person you will have the FREE Monterey and Magnolia treats everytime you spend anuwhere using your EastWest Visa credit card with minimum single receipts of P2,000 and P8,000. See below the details of the EastWest Visa credit card promo. EastWest Visa credit card promo treats runs from October 15 to December 14, 2012. Redemption period is from October 15 to February 11, 2013. So what are you waiting for. Shop now with your EastWest Visa credit cards. One Response for "EastWest Bank Credit Card 2016 Promo & 2017 Perks"